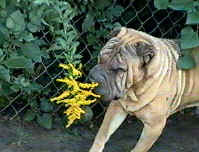 the flowers, now you can smell all the flowers at Rainbow Bridge. I miss you so much. 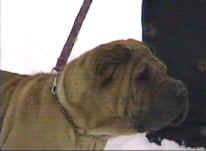 I will see you and Gunner at the bridge someday..
Austin was a fawn horse coat Sharpei, he was always happy to go for rides in the car, he was such a sweet boy. I brought Austin home when he was about 2 - 3 months old. He was always a happy puppy. And he grew up to be an awesome boy. See I was going to have him be my show dog since he was so nice. he stopped eating and drinking, his breath smelled really bad and as I knew what to look for, I knew it was time to say good-bye to my boy.. 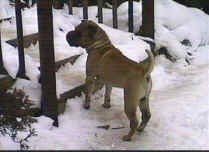 I sent him to the Rainbow bridge on 12-3-01 were he will wait until we are together again.. I love you Austin.. Until we me at the bridge.. bye bye. mommy loves you. The last picture (above) of Austin was just before he got sick, wasn't he handsome? don't think of your big mushy face and the happy wag of your tail..
you away from me so soon. 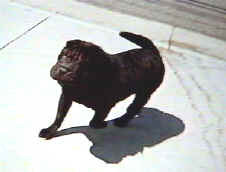 Rest in peace my sweet Gun Gun..
Gunner was a black brush coat male. she took the time to explain that it was SHS and he had a fever also. So she told me not to breed him and have him fixed, which is what I did.. The person I bought him from was contacted to let her know, she didn't believe me, said it wasn't true. Well I lost Gunner 2 days after his 4th birthday to kidney failure.. So much for not being true.. I am sorry this is so long but I felt like I had to let people know. Be careful who you deal with when it come to breeders. Some are not hones,. most are though. I was lucky that I found a wonderful breeder, and we became very good friends..
Sleep in peace Gunner mommy misses you so.